Help the game grow by submitting your own questions here. You'll face a series of 16 multiple choice questions. Answer each by selecting the letter, A - D, next to the choice you believe to be correct. Each game will consist of 2 'very easy' questions, 4 'easy, 'medium' and 'hard' questions and 2 'very hard' questions. In order to maintain a high standard of question you are encouraged to rate each questions once you have answered. Is the question interesting and it's level well judged? Then rate it highly! Some questions will have been submitted with a reference to a web page showing proof to the specified answer. For these questions, when you answer a 'Ref...' button will appear. Press it to be taken to the page. 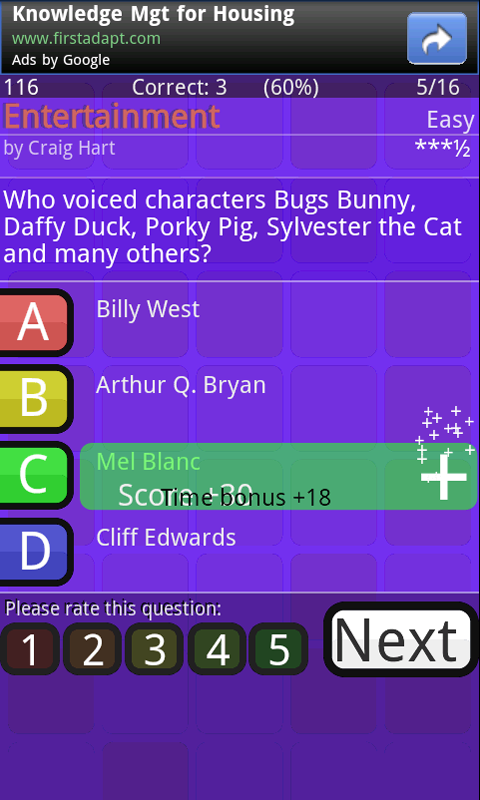 Press the back button on your phone to resume the quiz. The author of the question is responsible for the content of the link. Feel free to mark the question down if it is inappropriate. The maximum score is therefore 1410. Our Quiz is a community game. Please use this form to submit a question into our data base. You will be credited in game. See if your question can become the most popular? 1 Lol 4.25 4 What does PMS stand for? 2 Craig Hart 4 255 Which of the following did not win a Nobel Peace Prize? 3 Craig Hart 4 235 To which house does Juliet belong in Shakespeare's play Romeo and Juliet? 4 Craig Hart 4 202 What type of cloud would you associate with heavy rain? 5 Craig Hart 4 194 Who is credited with inventing the World Wide Web? 6 Craig Hart 4 185 Which city has the highest number of (US$) billionaires (2009)? 7 Craig Hart 4 133 How many sides does a Tetradecagon have? 8 Craig Hart 4 121 Who first isolated DNA? 9 ojb 4 106 Which country is largest (in area)? 10 Craig Hart 4 91 Who invented the QWERTY keyboard layout? I believe there is an option to uninstall in Settings > Applications > Manage Applications > Our Quiz. If that doesn't work, try restarting the phone and trying again. In order to support the downloading of questions and the uploading of hi score data to this web site.